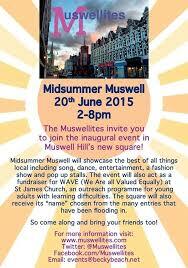 We’re looking forward to Midsummer Muswell, a party to celebrate Muswell Hill’s new square opposite St James’ Church. There will be loads of music and dance, and good food and MHSG will be running a stall. Drop by and say hello and maybe win a prize or two!